Casting call for ages 9-13 Saturday morning, May 4, 2019, at WKAR. Do you know a child who loves science and loves experimenting? Maybe they could be the next cast member on the Emmy award-winning WKAR original series Curious Crew! 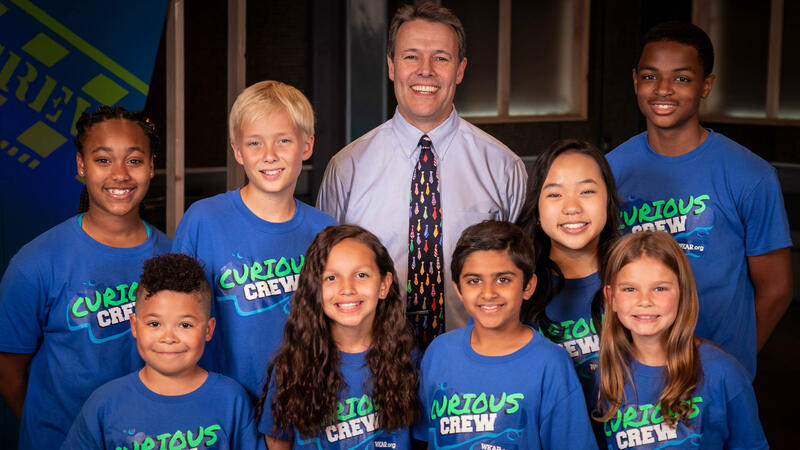 We're holding an open casting call for children ages 9 to 13 for season six of Curious Crew, scheduled for production this summer. Children must be at least 9 to 13 years old on May 4, 2019. Curious Crew cast member positions are non-union and non-paid. A parent or guardian must accompany any child auditioning. Please bring a completed and signed WKAR Release Form for quicker check-in. Check-in will be inside the South Entrance of the Communication Arts & Sciences Building. Google Maps. Free parking is available in the adjacent ramp and surface lot located at the northeast corner of Trowbridge and Red Cedar. Please be aware that May 4 is also Spring Term Commencement Day at Michigan State University and as a result, parking space may be limited and traffic may be congested. How does that work? What happens next? Host Dr. Rob Stephenson and a group of inquisitive kids take a hands-on approach to scientific exploration! In the first five seasons of the series, Emmy Award-Winner Dr. Rob and the Curious Crew cast members explored various science themes including center of gravity, sense of hearing, basketball science, chocolate chemistry, and more STEM topics. Season five also featured Curious About Career segments of female professionals working in a wide variety of STEM-related fields. This Emmy award-winning original series from WKAR Public Media at Michigan State University debuted on WKAR-HD in November of 2014. Seasons 1-5 of Curious Crew are available for viewing at video.wkar.org and in the PBS App on iPad, iPhone, Roku, Xbox 360, Apple TV. Dr. Rob Stephenson is an Emmy Award-Winner, National Teacher of the Year finalist, 2009-2010 Michigan Teacher of the Year, and 2006 winner of the Presidential Award for Excellence in Science Teaching. He is currently STEM Consultant for the Ingham Intermediate School District. Curious Crew Season Five was made possible in part by Michigan State University Federal Credit Union, Consumers Energy and Viewers Like You. For frequently asked questions about the 2019 Curious Crew Casting Call, please CLICK HERE. For more questions regarding the Curious Crew casting call, please contact (517) 884-4700.